The Green Healthcare programme is launching its Water Efficiency guide at a HSE Water Workshop in Tullamore at the Midlands Regional Hospital on 10th October 2017. 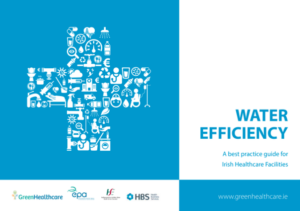 The guide looks at efficient water use in a healthcare setting, and includes benchmarking of Irish healthcare facilities in terms of water use. It covers monitoring of water use, benchmarking, leak identification, surveying main water users, sub-metering, as well as identifying best practice flowrates for fixtures and fittings. A brief guide to setting up a water efficiency programme is also set out.